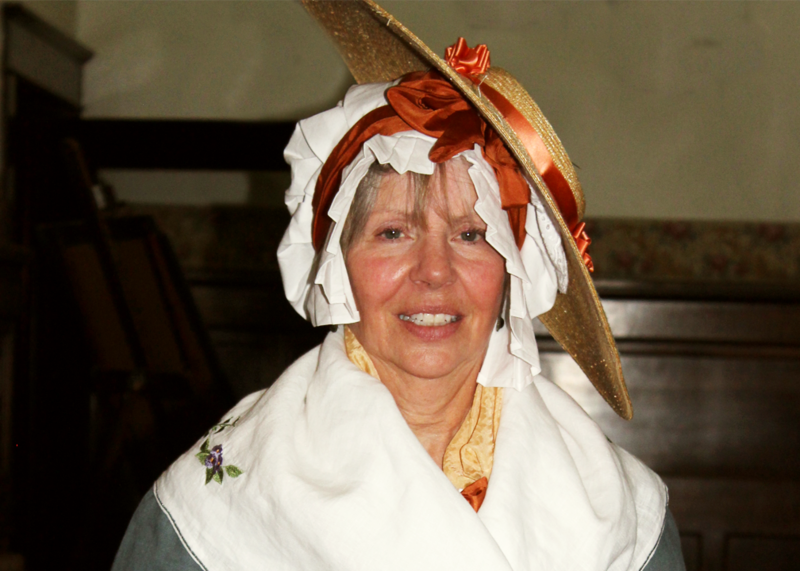 At the start, Shelly asked for a “rural woman 1790-1810, Kentucky”. 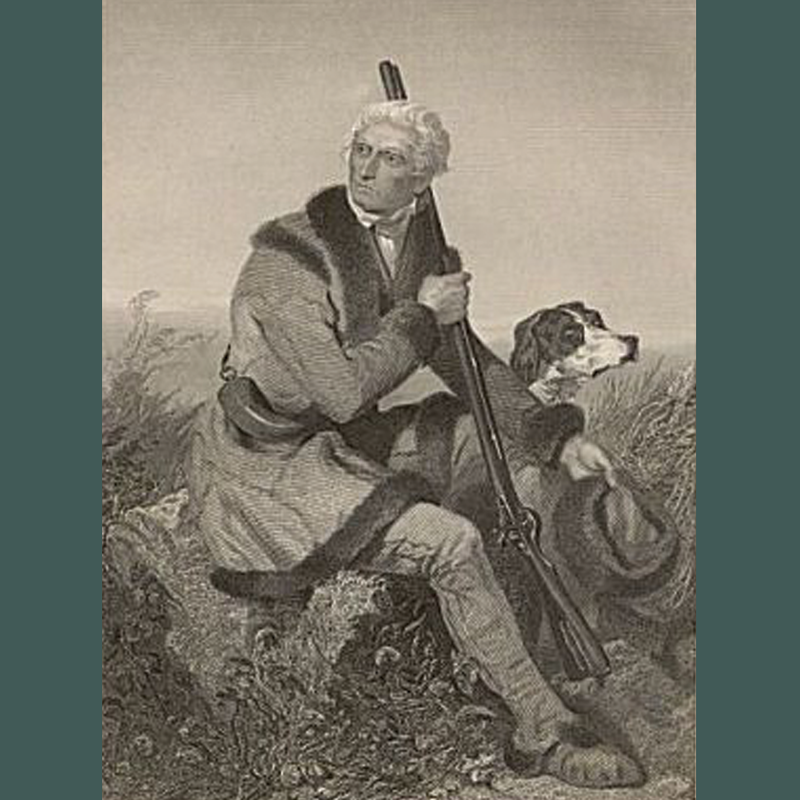 The original character portrayal is her own relative, Hannah Boone who was the wife of Daniel Boone. Hannah was left for years on end to take care of children while Daniel was out “doing his thing”. 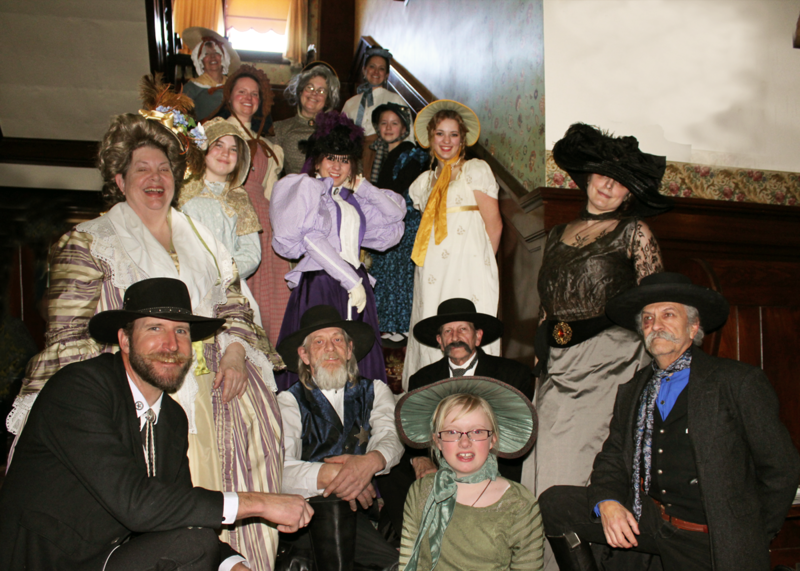 After his death, she remarried a somewhat prominent man of the community & moved to town. This 1790 portrayal had some challenges because the year 1790 sits on the crux of the Georgian/Colonial/Regency fashion eras. Each of those are REALLY different in philosophy, concept, & construction, so Shelly had to make key decisions based on character rather than strictly fashion trends. 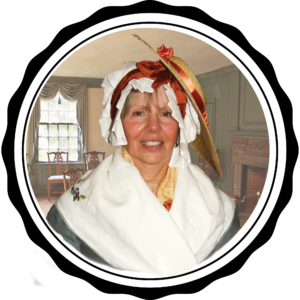 Hannah Boone lived her adult life through the American Revolutionary War. She might have lived near enough to battles, or at least known about them secondhand. 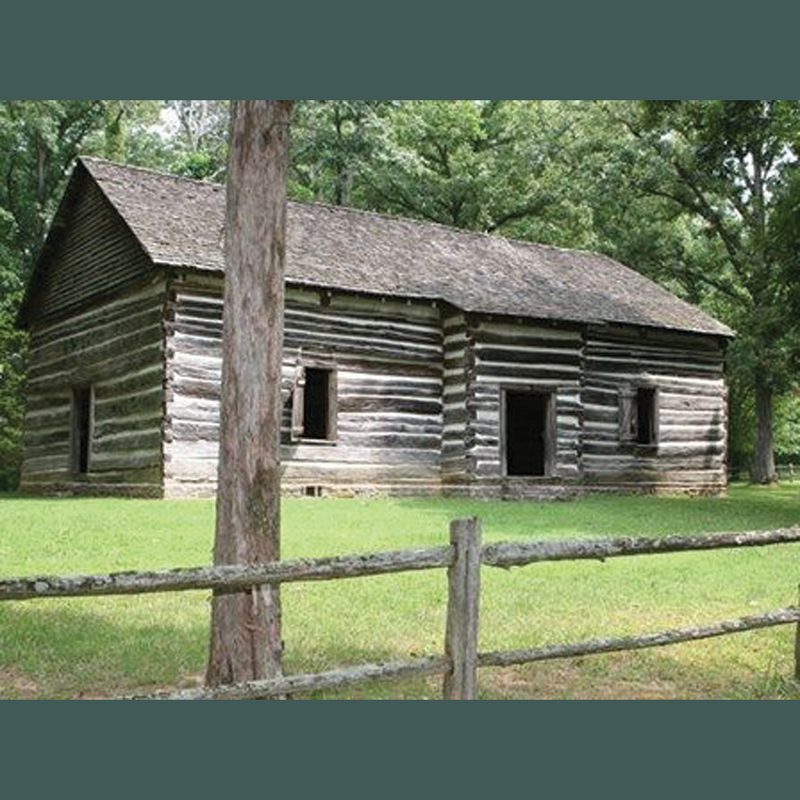 She would have been affected by the change in the availability of goods & services, & she most likely had to “make do” for many years on her own. She was apparently a strong woman physically & of character: at the time of depiction, Hannah is in her late 50’s, which was considered elderly in that time where 65 years was a typical lifespan. Shelly decided her character would have “hung on” to her past a bit for emotional comfort & to be practical & financially restrained. 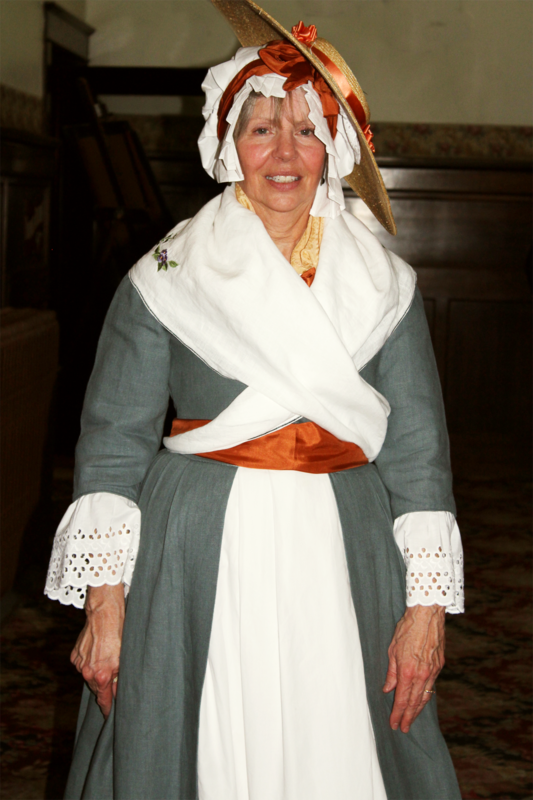 She would have re-used fabrics or clothing & especially undergarments because the new United States was in recovery. As a caring woman, she most likely would have given fabric or clothing, food or service to the cause, leaving her with little to start with at the time we pick up her story. Hannah had just remarried & moved from a log cabin in the woods to town, & would want to be considered fashionable in her new life. 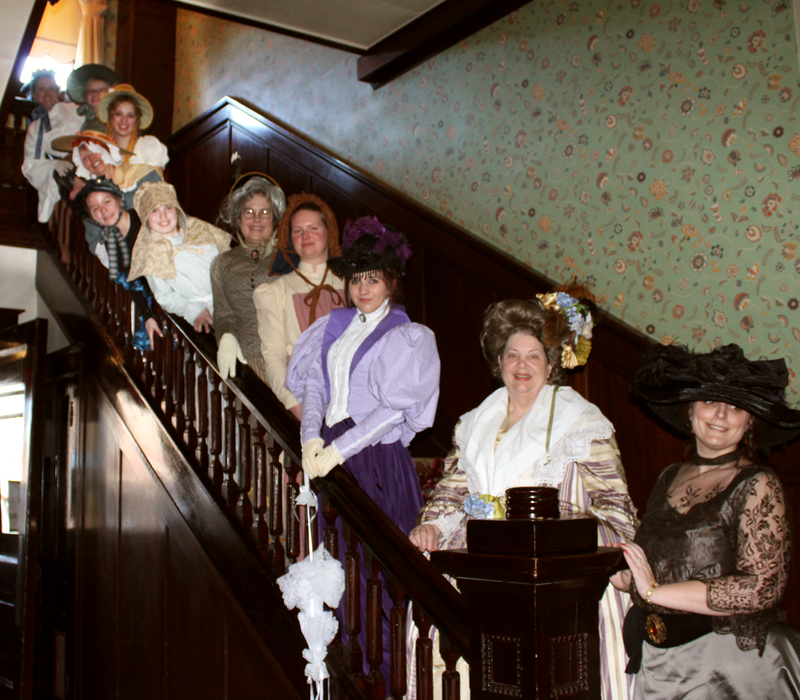 This change in status & attitude would affect garment decisions because in that era, things like types & color of fabrics, number of petticoats, & length of skirts were indicators of class & wealth. Shelly made many key choices based on these concepts: to keep Hannah’s fashion a bit out of fashion, comfortable, & simple. She decided to add small & inexpensive fun & flounces using color, accessories, & fabrics to a basic, multi-functional, practical, & somewhat tailored ensemble. We build from “The Bum Up”. 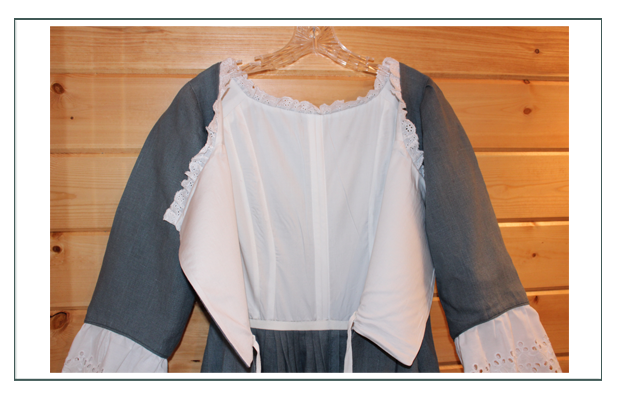 1790 starts with no modern undergarments, & a chemise. 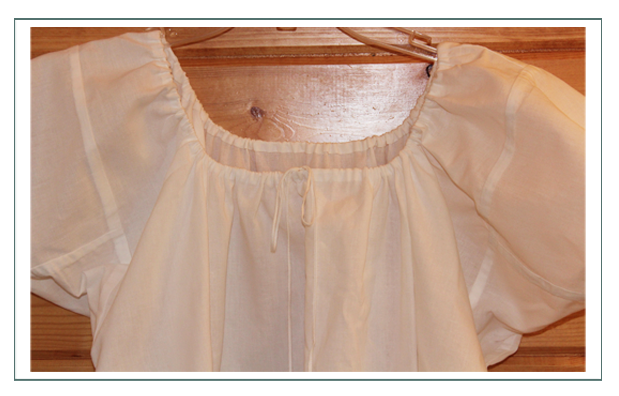 It is of simple bleached muslin with all hand construction, French seams, underarm gussets, & an inside tie. 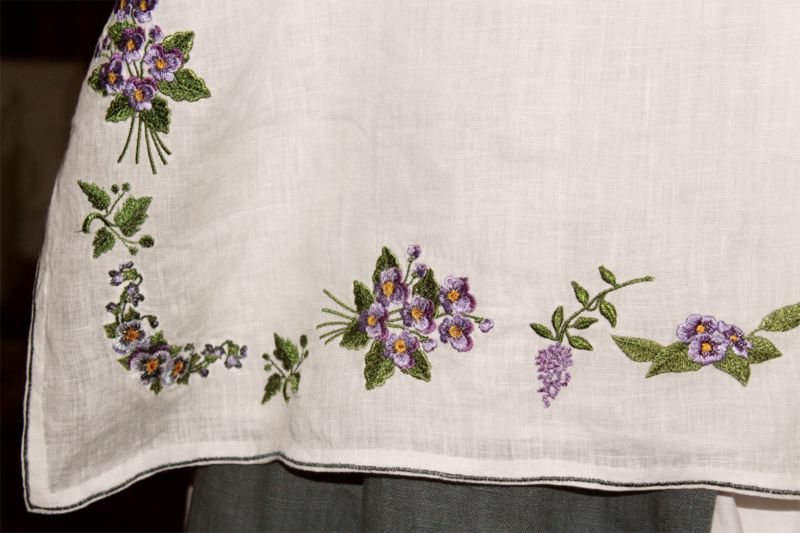 A special feature of this era is to have your initials & date cross-stitched at the side seam so your housekeeper knows whose it is, and which is its wash day. 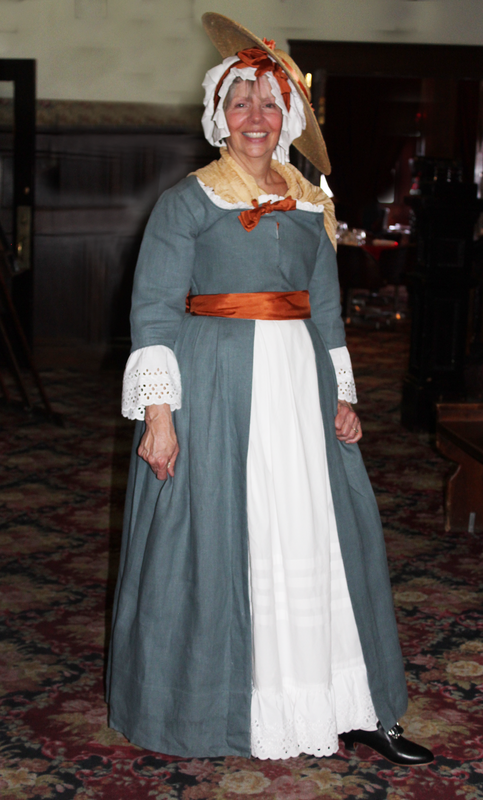 Because we had many choices crossing over eras, we decided on a slightly shortened version of the 1780’s stays, so it could be used to depict characters as far back as 1770 and ahead into 1810. 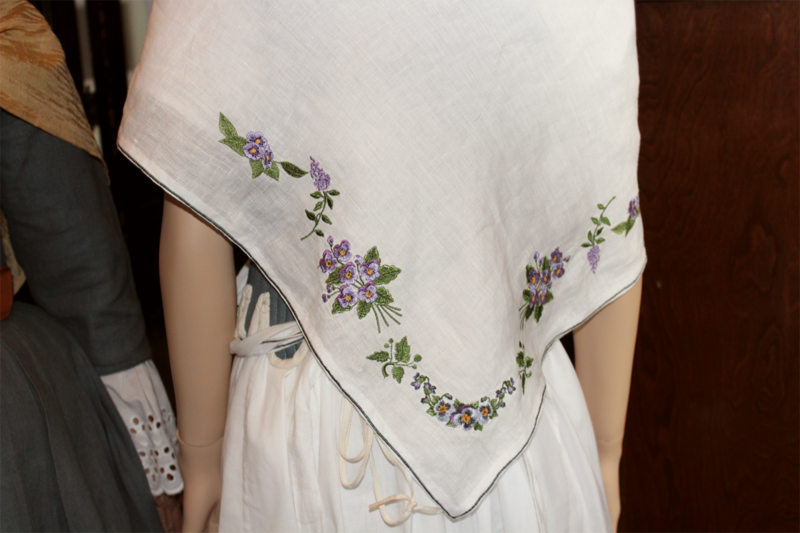 These were both made of linen with machine stitching in 100% cotton thread. 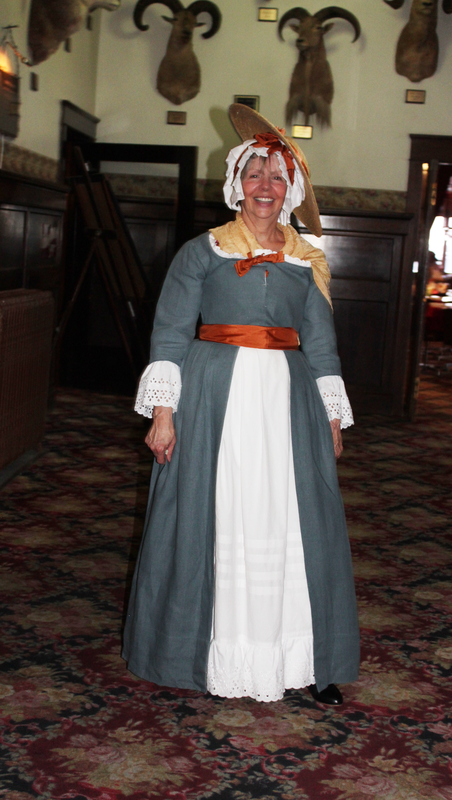 This was a custom design based on historical patterns & garments. 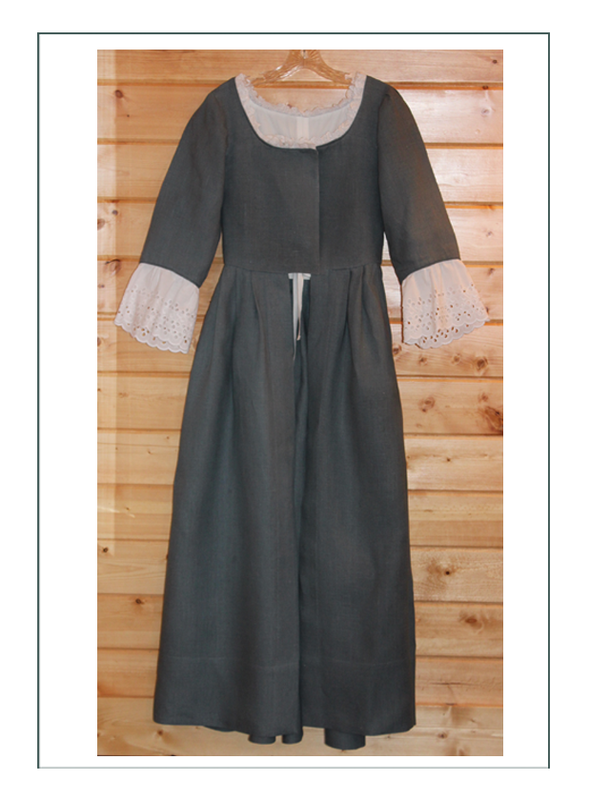 There was a choice of the earlier 4 pieced version (front, back, each side made separately, each boned top to bottom, & then whipped together at the seams), or the 6 piece version (angle pieced crossing over the front & sides and then boned). We chose the more difficult & later 6 piece version. 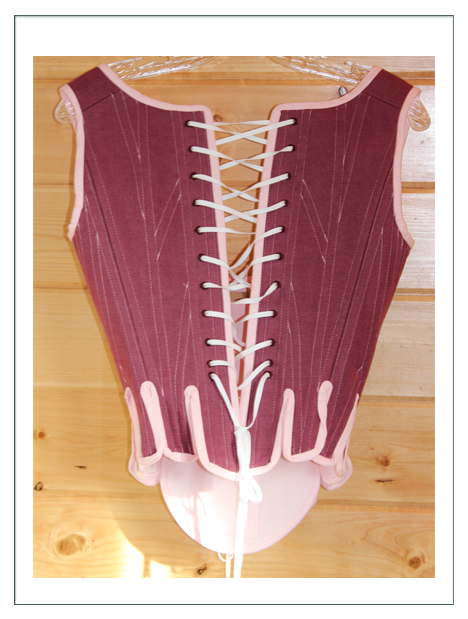 It included a 2″x 10″ straight wooden busk (because we shortened it overall) down the center, and our own stomacher. 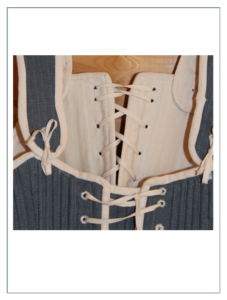 The stays are designed to create the cone-shaped illusion required of the period, and to force the wearer into straight posture. It’s most important criteria is to have cross-boning to keep the breasts from spilling over. 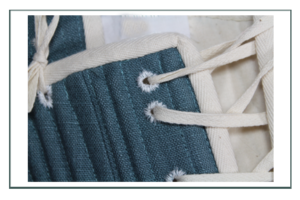 This affected the hole placement which would normally be offset for period-correct spiral lacing, so when these stays are laced, they are intentionally offset top and bottom. 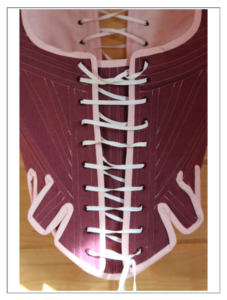 Having both front & back lacing since Shelly doesn’t have a maid to help her, there were 45 hand-whipped eyelets made of silk twist (button hole weight) thread. 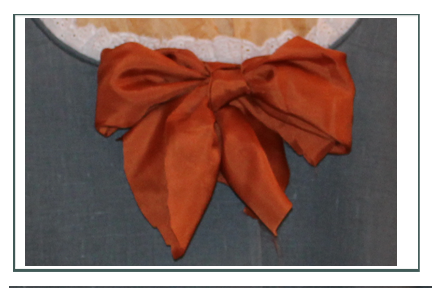 We designed custom straps that could be used or not with real silk bows. 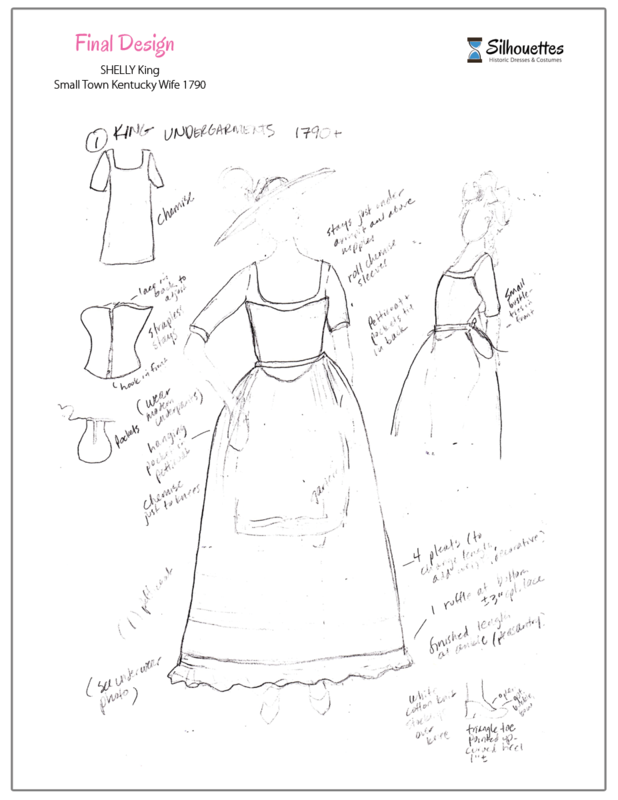 The straps are worn as an option because later styles have wider front openings of the bodice, & they might show if Shelly wants to have another character in the regency era. There are no patterns at all for “Corks”,”Rumps”,”Rump Pads”, etc. There are few (if any) photos or extant garments. The only way to build these is from descriptions, and that is what we did. 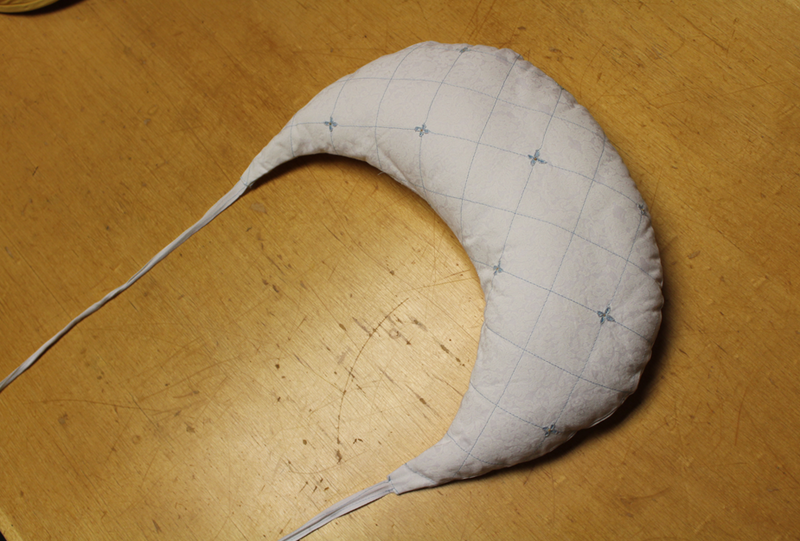 Working from Shelly’s measurements & the desired size & projection, we built a stuffed “half moon” crescent of muslin that looked much like the guts of a modern day stadium cushion. 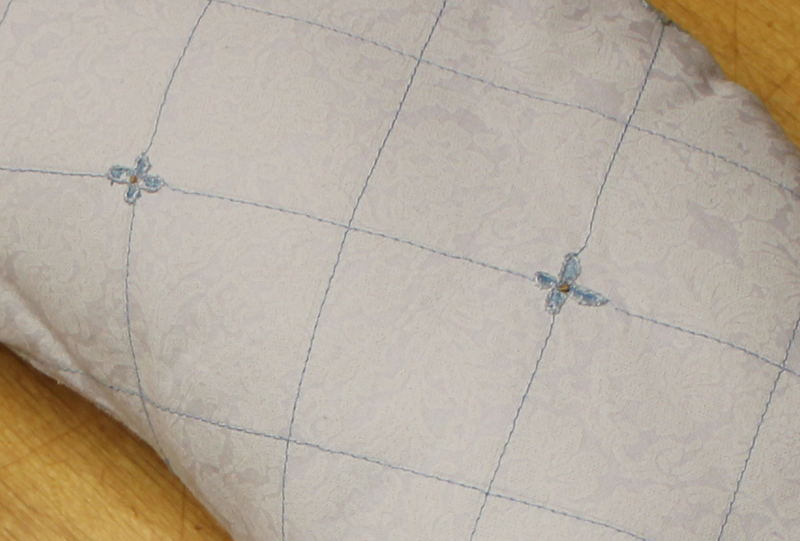 Using only 100% cotton batting, it was carefully placed inside to get the desired shape. An outer decorative shell with tape ties was added. 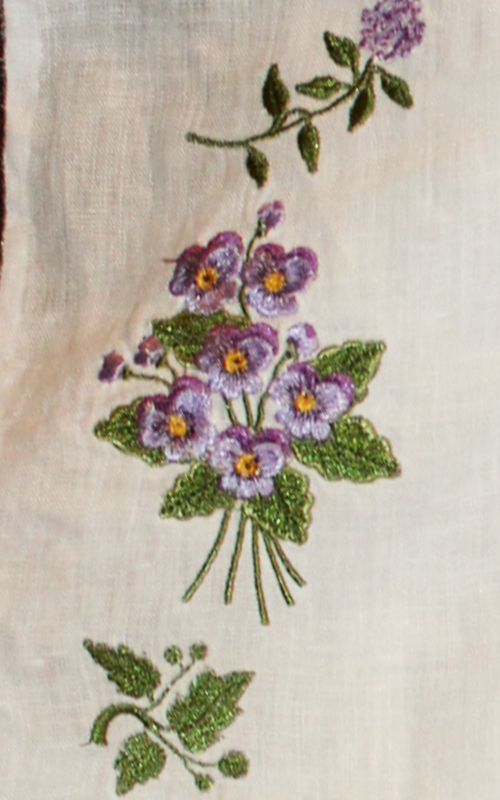 We embroidered this to match embroidery on other garments in a tiny flower quilted pattern. Only the woman knows how lovely she is on the inside. 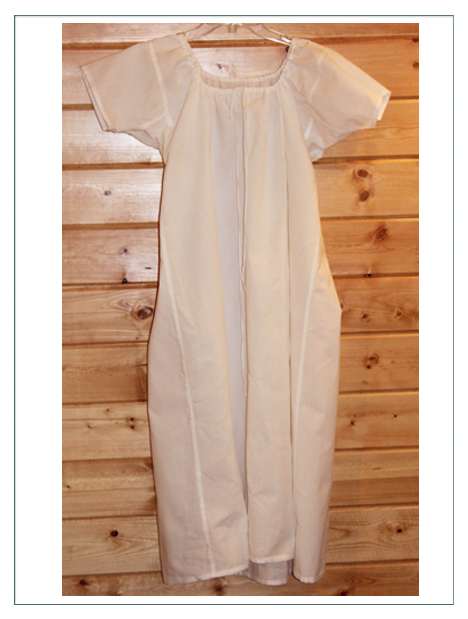 The robe (gown) is a basic Round Robe with a higher than natural waistline. 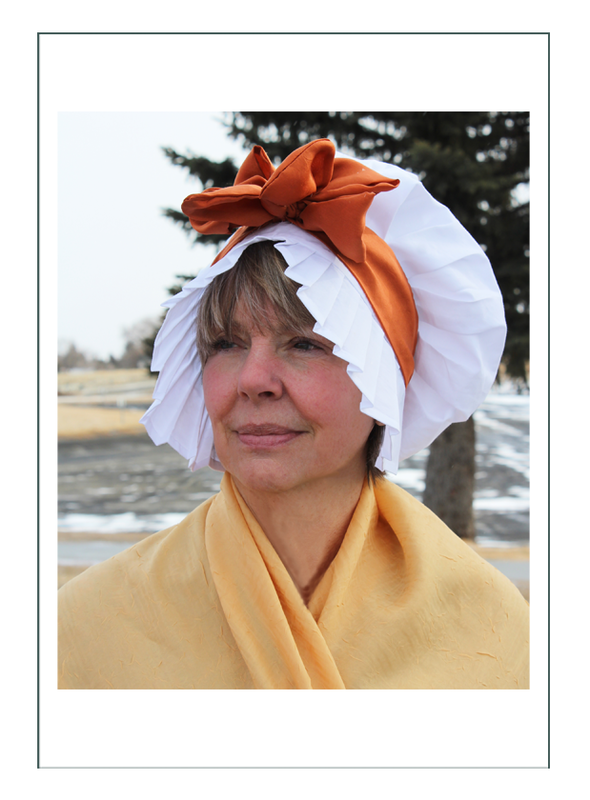 It is built of a 7.1 (heavy) weight muslin of period accuracy. 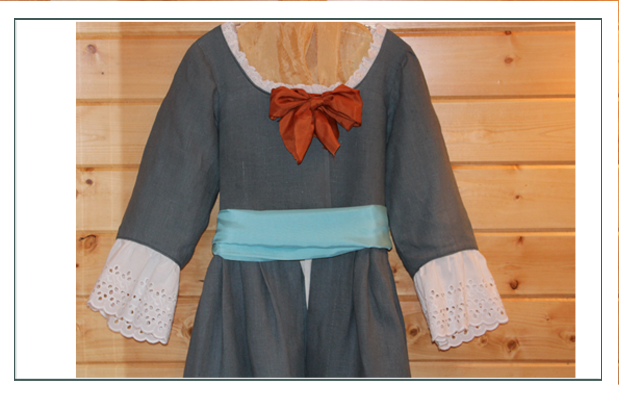 The bodice and sleeves are fully lined with 100% cotton sateen which breathes nicely & is light and slippery. 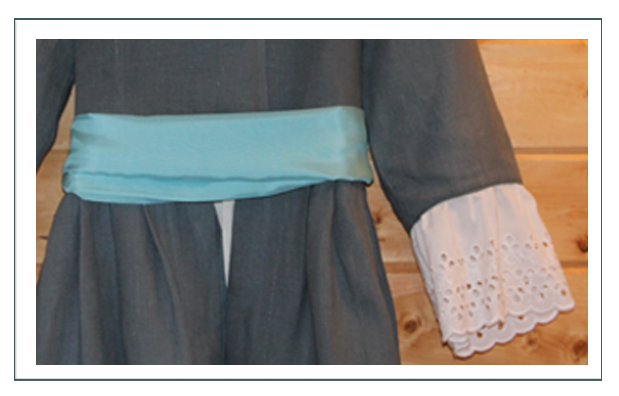 While normally the sleeve ruffs would be pinned on and not sewn in, we sewed them in because this garment would not get enough wear to merit the removeable method. 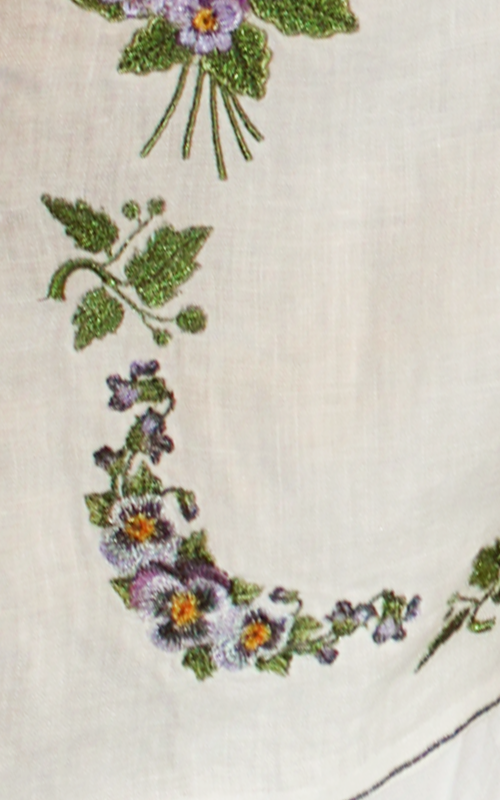 The entire neckline and sleeves are piped in self fabric, and the lace is an embroidered eyelet lace. 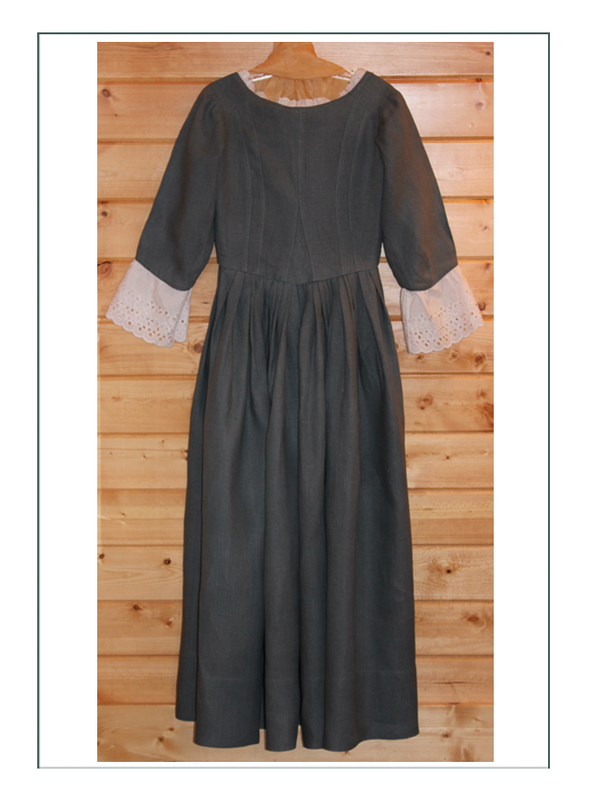 Admittedly, the eyelet is machine made & the fabric includes some polyester as 100% cotton eyelet lace is cost prohibitive for this project. 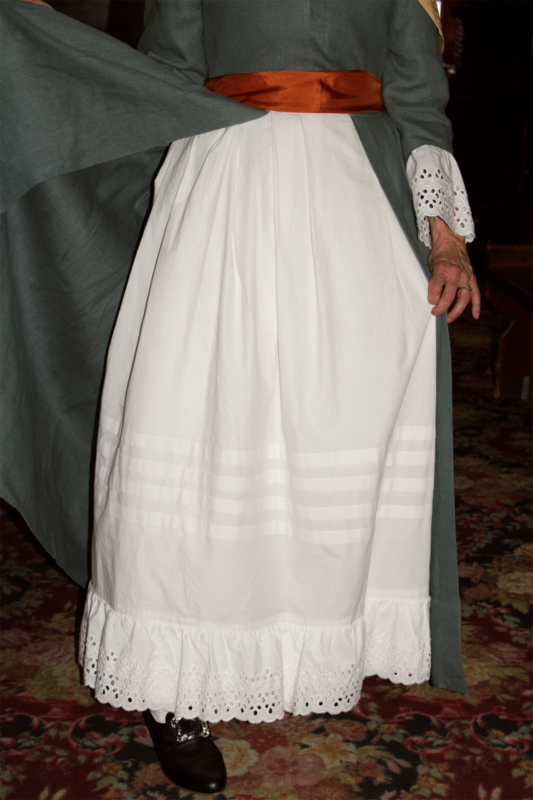 The robe is of 2 parts, with the bodice being constructed first and then having the skirt handstitched on using box pleats for the large “over the rump” area, and flat pleats in front. 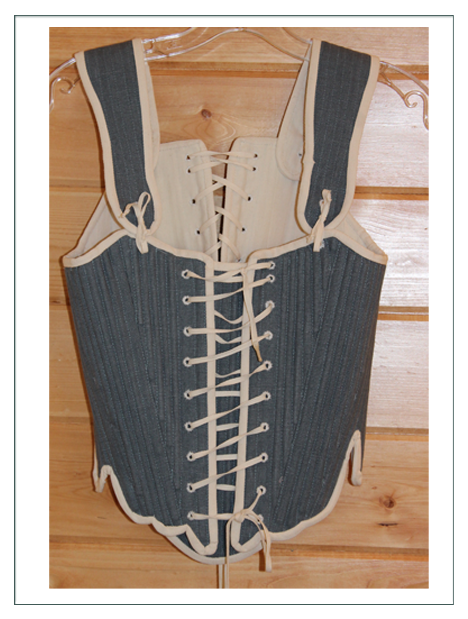 The overall visual achievement is for a smoothe flat front and large rump back with the bosoms fully exposed and almost overflowing the bodice. 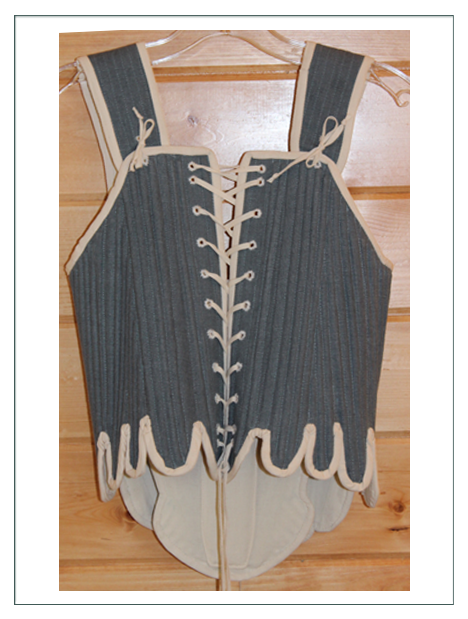 Shelly choose to cover the bodice for modesty of her character, & has a choice of fichus to either tuck inside her stays or wear outside like a shawl. 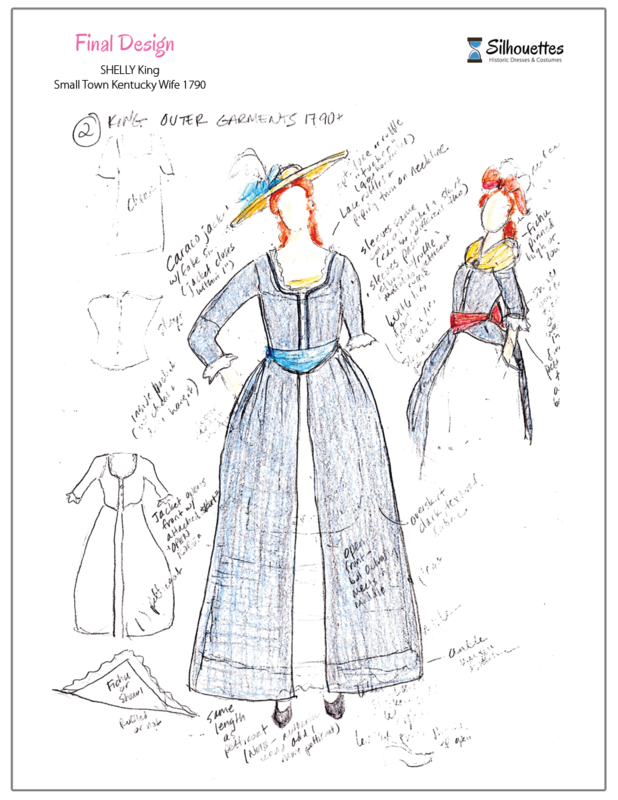 The skirt is large and flowing and just above the ground as is appropriate to the character’s class. Back construction is to be noted, as that is a key to different era construction. This era has fitted back side seams which we modified to fit the modern body which almost always has a larger waist and longer back length. For this we added a gusset in center back. 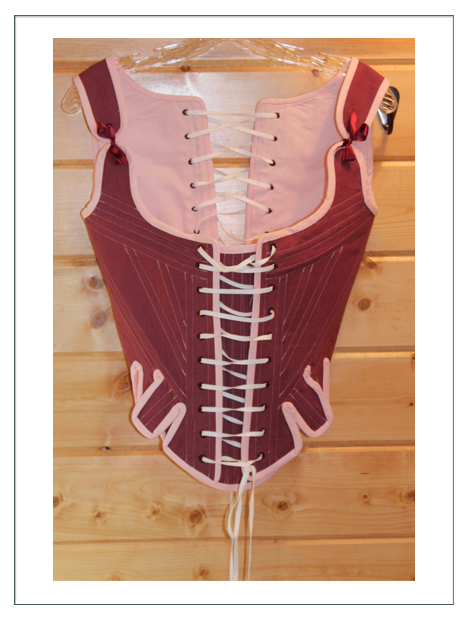 The other modification made is to add a twill tape at the inside waistline to bring the lower back tight above the derriere. 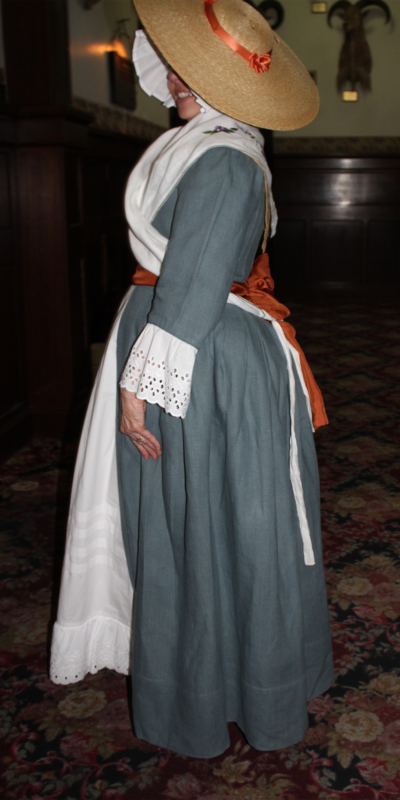 This is historically correct though a bit ahead of our character, as a woman of 1790 would have added the tape 5-6 years later to adjust to the newer styles. Otherwise, the pattern follows historical examples exactly in method & construction. 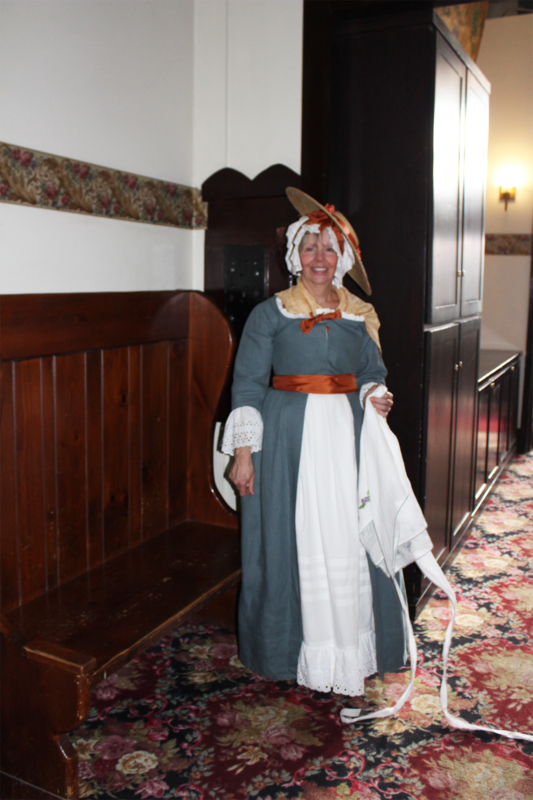 In the 18th century “petticoat” means an outer garment. 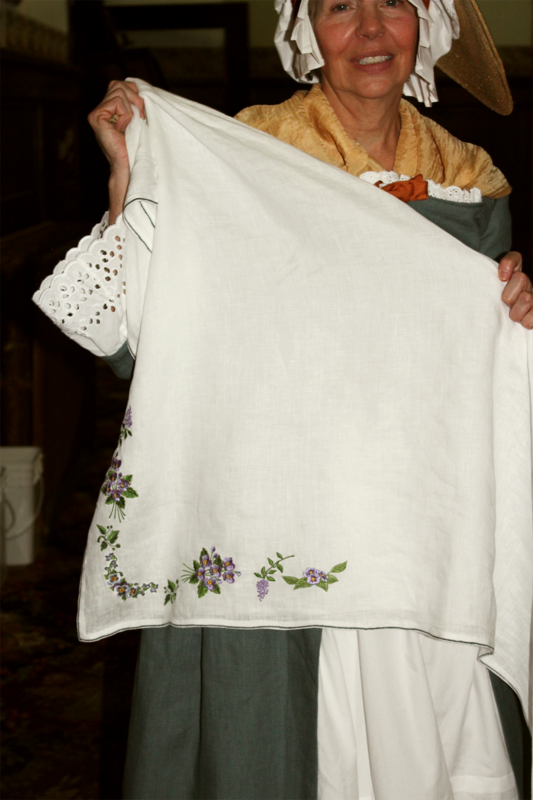 Shelly’s is of bleached muslin. It would have been of a lightweight linen originally. 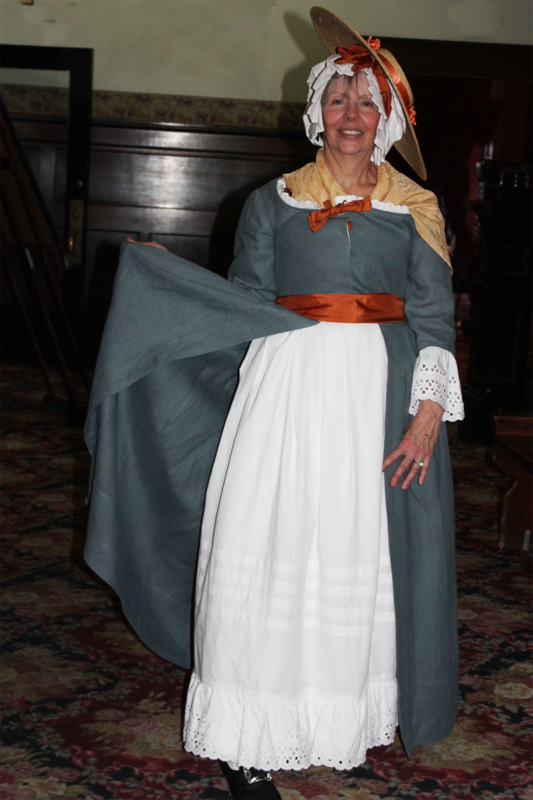 It has embroiderie a l’anglaise ruffle for trim, which shapes the skirt. 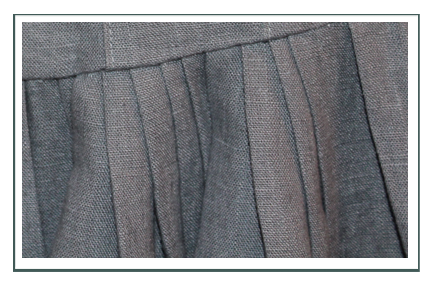 The pleats are for adjustment for season and as fashion changes, but they also add stiffness to hold the shape out into a light “bell”. 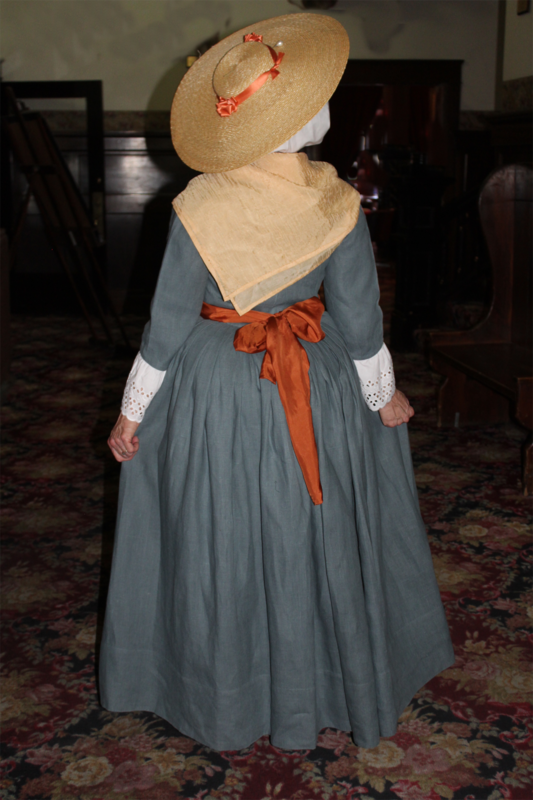 The trick to 18th century garments is that they are all tied around the waist, so each item is tied differently so the ties don’t all end up in the center front or center back. 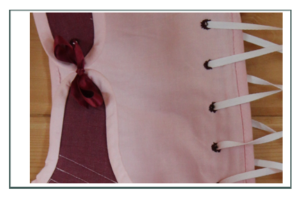 Shelly’s petticoat has loop ties on separated front and back sections of waistband. The shorter distance to the tie means a tighter cinch (think long clothes line versus short clothes line) so the skirt doesn’t drag center front or center back. It also allows the ties to be at the sides. 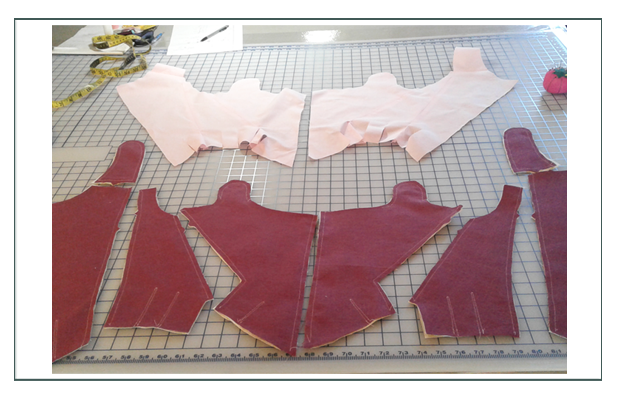 We had to do modification of the pleats and sizing of the petticoat because it was too big by 18″. 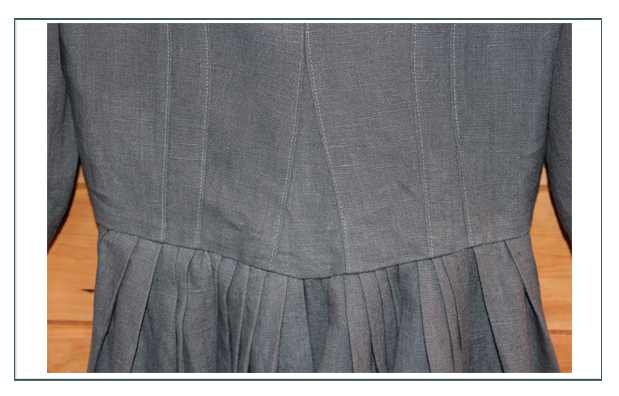 We just cut it off and re pleated. Now she’s not (quite) the Marshmellow Lady. 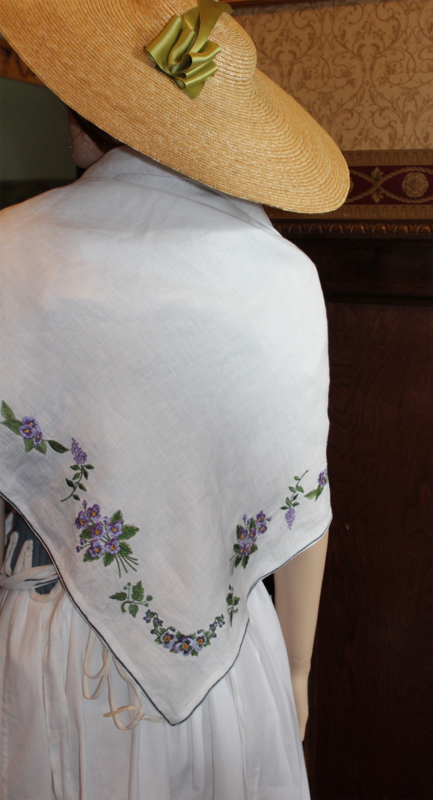 A machine embroidered, yet entirely handmade and custom designed fichu for Shelly is worn either outside as a scarf or drape, or tucked inside the bodice and tied around the waist as a “tucker”. 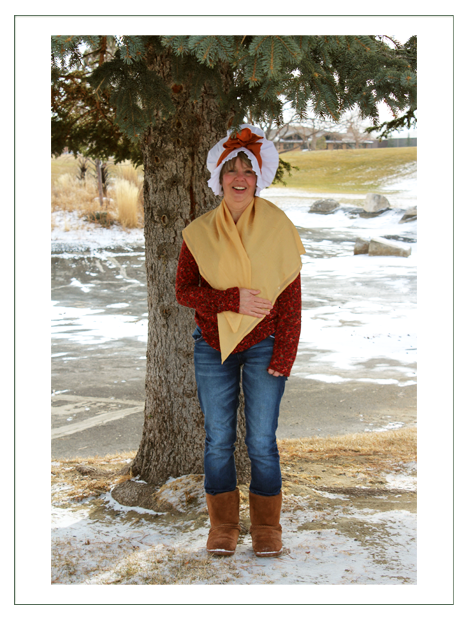 You can find Shelly in her costume at California & Wyoming storytelling festivals, singing in variety shows, & giving historical interpretations such as the “Jumping Frog” for elementary school children. 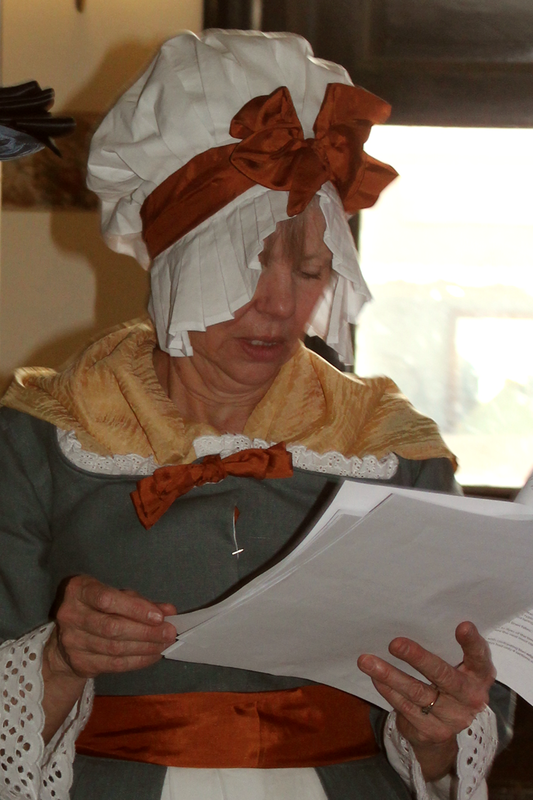 In the planning stages is an interpretive “Revolutionary War Striptease” for women’s history groups. One of the things that gives us great joy is that “aha” moment when our customer FEELS like their character, & starts to move & act differently. 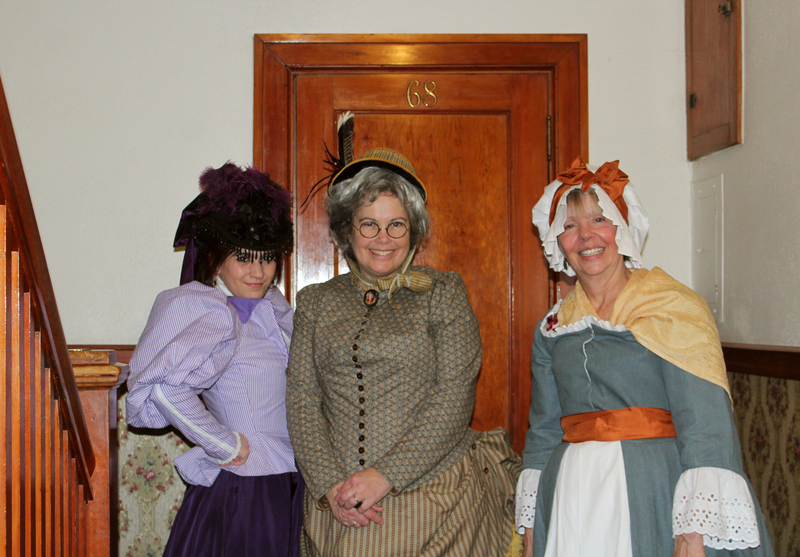 To get a few publicity shots for an upcoming audition, we met at the Cody library on a 20 degree day. You can see even with her modern ski boots, when Shelly puts on her “Hannah Hat” and becomes the “Giant Marshmellow Woman” as she calls herself in full costume, she takes on a whole different personna.